Metal detecting in Louisiana is controlled by many laws, both at the State, and the Federal level. First, the ARPA (Archeological Resources Preservation Act) is the Federal law. The ARPA law will be explained in detail below. However, you also need to be aware of city, town and village laws. If you plan to detect in any parks be sure there are no laws against it. People are getting arrested for breaking these laws. The link below is the ARPA law. I have pointed out and highlighted on this page the important areas of that law. Creates the Division of Archeology in the Department of Culture, Recreation and Tourism. Creates the position of state archeologist, who shall serve as director of the division. Directs the division to promulgate reasonable rules and regulations concerning the recovery and study of historic and prehistoric archeological remains that relate to the inhabitants, prehistory, history, government or culture, in, on or under any of the lands belonging to the state, including the tidelands, submerged lands and the bed of the sea within the jurisdiction of the state. Includes in the definition of such remains: all prehistoric and historic American Indian or aboriginal campsites; dwellings, habitation sites, burial grounds and archeological sites of every character; all historic sites, objects and buildings; all sunken or abandoned ships and wrecks of the sea or rivers, or any part of the content thereof; all treasure embedded in the earth or underwater; and all maps, records, documents, books, artifacts and implements of culture that relate to such archeological remains. Directs the division also to undertake the following functions: maintain the state archeological site files; function as legal custodian for all archeological artifacts and objects of antiquity that have been recovered from state lands or donated from private lands, except those donated to the Louisiana State Museum or the Office of Parks; implement a program of activities that will make available to the public information about the historic and prehistoric resources of the state; serve as the archeological advisory source for all state agencies by assisting them in evaluating anypotential impact of their projects on archeological resources; administer those portions of the National Historic Preservation Act relative to archeology; advise the secretary of the Department of Culture, Recreation and Tourism and the state historic preservation officer on matters affecting archeology; administer an archeological grants program; and implement for the state the federal Abandoned Shipwrecks Act. This page gives a synopsis of the ARPA law. You better know what the laws are before you dig. Metal detecting in Louisiana, on private property is okay, but ask for permission first. However, if you metal detecting in Louisiana you need to follow these laws about digging and removal of artifacts. Directs the chief administrative officers of all state agencies to cooperate with and assist the Division of Archeology, the secretary of the Department of Culture, Recreation and Tourism and the attorney general in carrying out the purposes and intent of this chapter. Directs all state and local law enforcement agencies to assist in enforcing this chapter. If you are metal detecting in Louisiana and you break this law you can be punished. Please Read Below. Creates the Ancient Mounds Heritage Area and Trails Advisory Commission to be composed of: four members appointed by the governor who live in the northeast and central areas of the state and who have demonstrated a sincere interest in the subject; the assistant secretary of the Office of State Parks or a designee; the assistant secretary of the Office of Tourism or a designee; the director of the Bureau of Indian Affairs; the state archeologist; and the secretary of the Department of Transportation and Development or a designee. Declares that creation of the commission will facilitate and encourage voluntary participation of private landowners, local and state business leaders, local and state governmental officials, and archeologists to develop fully the potential of the Ancient Mounds Heritage Area and Trails as a cultural, recreational and educational attraction and to enhance the development of tourism in the state. Declares that creation of the commission will establish a means to identify the monumental archeological sites within the ancient mounds heritage area, recognize the significance of those sites and designate historic trails to link, interpret and enjoy the sites. Directs the commission to study, make recommendations and advise the governor and the legislature on appropriate measures with regard to the development of the Ancient Mounds Heritage Area and Trails as a cultural, recreational and educational attraction to help preserve Louisiana’s prehistoric patrimony and to understand the state’s heritage better in order to enhance the development of tourism. Remember, if you are metal detecting in Louisiana, and you are not sure of the law, do not dig anything that you believe is an artifact, or anything that is older than 100 years, especially if you are on any State Lands. If you are metal detecting in Louisiana on private property, then be sure you have written permission from the landowner. For metal detecting in Louisiana town, village and city parks, you'll need to check with those local officials. Here is a recent law regarding metal detecting in Louisiana Parks. Louisiana Administrative Code Title 25:IX. Chapter 3, §303. Park Property and Environment, Part H - "The display, possession, and/or use of metal detectors or similar devices is prohibited. It is strictly forbidden to dig for or otherwise remove any historical feature, relic or artifact. Persons wishing to excavate and remove historical features by professional archaeological means for research purposes must request a permit from the Louisiana Archaeological Survey and Antiquities Commission. Applications for such permits must be made through the assistant secretary, Office of State Parks." Have you had your fill of too many laws in Louisiana? Do not let the beauracrats stop you from enjoying the hobby. Here is an organization that can help all of us. 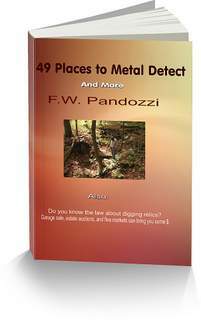 Have you tried metal detecting in Louisiana ghost towns?